One thing's for certain: No matter your age or coolness factor, the allure of fireworks is pretty irresistible. 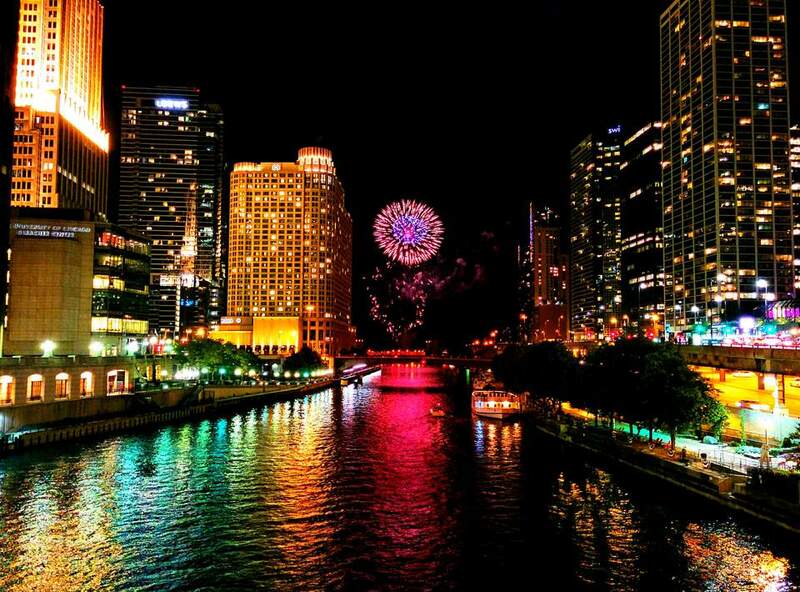 During summer in Chicago, fireworks displays are a regular occurrence, with weekly events happening during White Sox games and at Navy Pier. If you're at the right place at the right time, you can sit back, relax, and enjoy the fireworks over food and drinks. The former John Hancock Observatory has transformed dramatically in its new identity as 360 CHICAGO. New owners have extensively renovated the concourse and observation deck, adding LED lighting, plus an interactive exhibition spotlights the city’s history, architecture, and neighborhoods. The Architect’s Corner Café & Bar serves artisanal small bites and beverages, including specialty cocktails, wine and craft beers visitors can enjoy on west-facing stadium seats. It's located on the Magnificent Mile. Views of Navy Pier's fireworks display are completely unobstructed and can be seen 9:30 p.m. Wednesdays and Saturdays from Memorial Day weekend to mid-September. They also occur on July 4 and New Year's Eve. 360 CHICAGO offers themed music, food, and drinks during every viewing party. Situated on the top of Lake Point Towers residences, Cité is directly across the street from Navy Pier. One of its best features is that it offers guests a 360-degree view of the city, which includes skyscrapers and the lakefront. There's a sky lounge menu, which includes mini crab cakes, mini steak burgers and seafood samplers. Entrées on this American- and French-influenced menu range from butter-poached Maine lobster over pasta to honey lavender-roasted duck breast. Views of Navy Pier's fireworks display are completely unobstructed. Address: 505 N. Lake Shore Dr. Located on the lobby level of W Chicago-Lakeshore, Current showcases seasonal Italian cuisine. The menu features house-made pasta, pizzas and house-cured meats at moderate prices. The dishes complement Italian wines and Italian-inspired cocktails. Those visiting the bar may also indulge in a number of thoughtful cocktails, craft beers, and smaller bites as they listen to modern music spun by local deejays. The restaurant/lounge extends to an outdoor patio accommodating approximately 30 guests. There is also the WET deck, which is adjacent to the pool area, an outdoor terrace on the 7th floor where guests may order cocktails and appetizers. Address: 644 N. Lake Shore Dr.
You'll find Eno Wine Bar on the lobby level of the Intercontinental Hotel--which is also home to Michael Jordan's Steak House. While guys go to Jordan's for the 45-day aged Porterhouse for two, ladies settle into this plush pub to match artisan chocolate truffles and cheeses with small-batch wine. You may also order wine, cheese, and chocolates by the flight. There's an adjacent shop where you can purchase what you enjoyed. Sit on the patio in cushy chairs for views of Navy Pier's fireworks display. Situated on the 40th floor of the Chicago Stock Exchange, Everest specializes in the cuisine of Alsace, located in northeastern France. It's the award-winning, ultimate date destination by renowned chef Jean Joho, who puts his spin on Alsatian cooking. Menus are prix fixe, seasonal and take diners on a tour through Alsace with exceptional tastes of smoked meats, cold-pressed lobster, and regional wines. Of course, it's all done with a killer view as the backdrop. Parking is complimentary for guests. Guests who dine in the private dining rooms may see the fireworks displays at Guaranteed Rate Field during night games for the Chicago White Sox. In the main dining room, guests can only see small fireworks from the western suburbs during ​the Fourth of July weekend. Located on the 13th floor of Hotel Lincoln, upscale rooftop lounge J. Parker overlooks Lincoln Park. It seats 140 outside and 55 inside. There is a seasonal menu of pub fare that includes a signature burger, hummus, wings, and Midwestern cheeses. 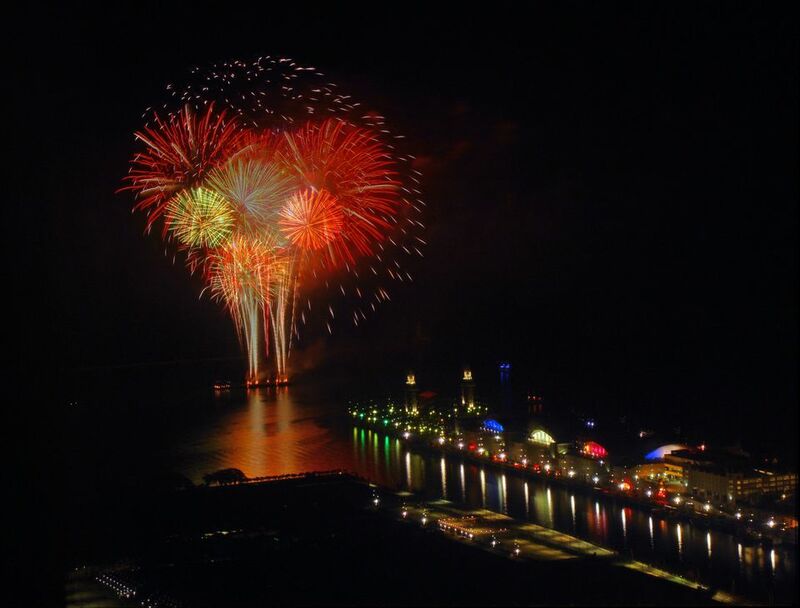 Views of Navy Pier's fireworks display can be seen. Address: 1860 N. Clark St. The only seafood-focused eatery on Chicago's lakefront, Riva offers premium views at Navy Pier for fireworks. It's also the fanciest restaurant on the Pier, offering chef-driven entrees, freshly shucked oysters and a number of prime steaks and chops. There is outdoor seating. The Signature Room at the 95th is in the heart of the Magnificent Mile shopping district and every view from the American-focused restaurant on the 95th floor is spectacular. During its more than 20-year history, The Signature Room has been the site for hundreds of marriage proposals. For the absolute best views of the city, request Table 111. The terrace lounge is on the third floor of the Loews Chicago Hotel in the Streeterville neighborhood. Streeterville Social is 9,000 square feet and feels like a park in the sky. It features two bars, contemporary lounge seating, stretches of grassy greenery, bar and lawn games (including a giant Jenga set) and modern fare. Guests get partial views of the Navy Pier fireworks from the rooftop. Address: 455 N. Park Dr.